The other day, in response to Erik Resly, I put up a little chart that separated "belief" from "sectarian" in contemporary Unitarian Universalism. I made them two axis, creating one of those 4 field grids so popular in training programs. 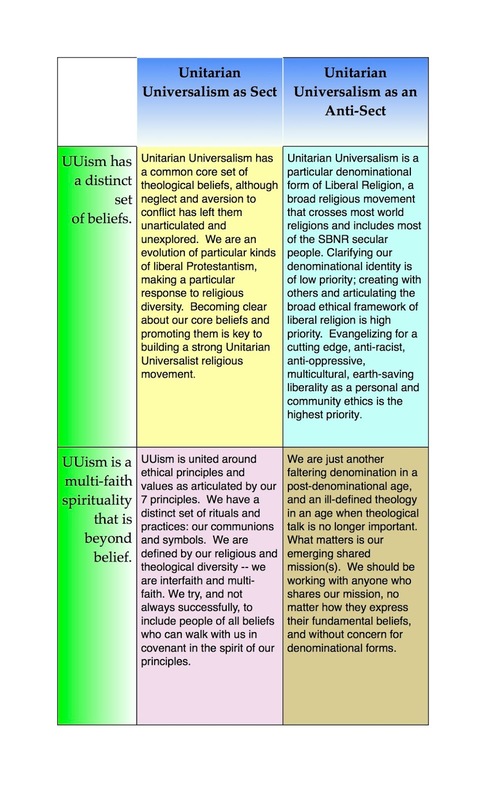 One axis is the continuum on the question of theological beliefs: do you believe that there are a distinct, even though buried, set of common theological beliefs in UUism, or do you believe that UUism is not defined by beliefs, but by something else: practices, ethics, values, rituals or whatever. The other axis is the continuum of opinion on sectarianism. 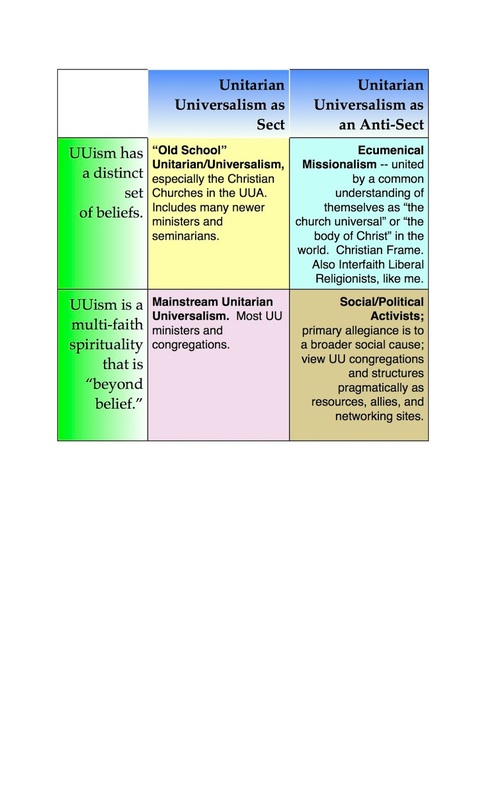 At one end would those who believe that Unitarian Universalism is a new and unique world religion, distinct and unto itself and at the other end are those who who believe that UUism is a transient organizational form of a much larger religious movement, in the way that Methodists believe that they are part of the Body of Christ, the world Christian movement. I am very interested in hearing from you all about how you think about Unitarian Universalism. Which quadrant makes sense to you? “Belief” are theological statements held in common. And I am defining theological in a fairly traditional manner. If you define “belief” as any firmly held mental affirmation, then it is impossible to be “beyond belief” unless one decides not to think. When Rev. Morales says that “what matters is not what you believe, but what you love” he obviously believes that, or he wouldn’t have said it. Is that a theological “belief”? I say no. “Sectarianism” is a primary focus on promoting Unitarian Universalism as a distinct and unique religious identity. Our “brand” to be crass. If your concern is the growth and health of UU congregations, our reputation in the world, the health of our denomination etc, then you have a sectarian focus. If you are reading this blog because you are trying to figure out the UU future, you are sectarian, at least in part. Is Missionalism the same thing as "Congregations and Beyond"? No, they differ by their sectarianism. Missionalism is localist: community organizing by faithful people, usually without regard to denominational identity. 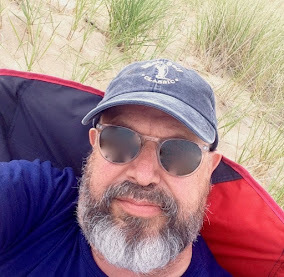 "Congregations and Beyond" is creating organizational forms for people who do not want to participate in conventional congregational life to connect to Unitarian Universalism. Missionalism is not when an established congregation redefines and recommits to its sense of congregational mission; that’s just good congregationalism and in most cases, sectarian. I appreciate the definitions that you included. However, I would disagree when you say that Morales stating “what matters is not what you believe, but what you love” is not a theological statement. I think it is. 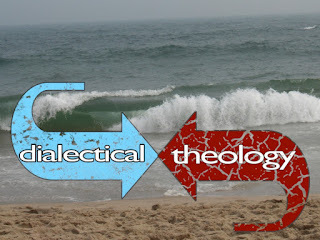 I think we define theological too narrowly. For me, anything that seeks an answer to the core questions about why are we here, how should we live, what has meaning, etc - those are theological questions and so the answers are also theological by nature. So I think that we have both a core belief/set of beliefs AND are multifaith at the same time. The bigger question you ask is "Are we too sectarian." On the one hand, after years of defining who we are not, what we don't believe, I can see how the answer might be yes. 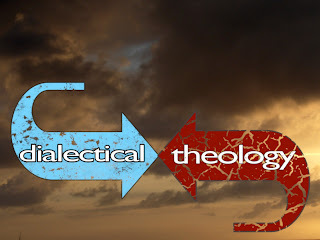 I think we do theology when we make statements like “what matters is not what you believe, but what you love”— some theologies are vague and lead to lack of clarity and some theologies suggest new awareness, new understandings, new "clarities." As throw-away nice words in a sermon “what matters is not what you believe,but what you love” sounds good, and suggests faith as verb, ratehr than the passive acceptance of propositions. But we do "believe" nevertheless. I think the task is two fold and the tasks can not be separated. 1. Becoming aware of the sectarian nature of UU identity, UU self definition. Identifying its various expressions, its various forms. 2.Understanding why "sectarianism is from Hell" as Channing was wont to say. Why it limits and makes a mockery of all our efforts. Why it is spiritually, religiously and theologically banal. Then we can ask "what are the alternatives" (such as ecumenical missionalism, or ecumenical campaigning to address poverty, social violence and eco-violence.